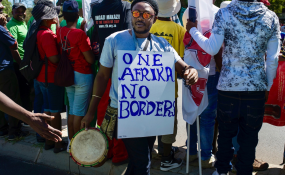 A man with a sign calling for the abolition of borders on the African continent is seen during the anti-xenophobia march in Johannesburg (file photo). Cape Town — Human Rights Watch and the African Diaspora Forum have called for the urgent investigation and prosecution of those responsible for a spate of attacks against migrants, most of them from Malawi, in Durban from March 25 to April 2. Dr Vusumuzi Sibanda, Chairperson of the African Diaspora Forum, spoke to allAfrica's Andre van Wyk to share his thoughts on the effects of xenophobia and what it means for South Africa. Hello, Dr Sibanda. A thesis by Live Hågensen from the Faculty of Arts and Social Sciences at Stellenbosch University in 2014 stated that officials seeking to gain support ahead of elections are a primary trigger for xenophobic violence. Do you agree? We wrote to the Independent Electoral Commission some time last year in November because our feeling is definitely that there are a lot of politicians in government, either from the ANC or the Democratic Alliance, are using populist rhetoric, saying that migrants are responsible for crime and that they cause a shortage in housing and land and are overburdening the health system. They do this in order for them to become popular again so, yes, we agree with that statement. What roles can South African citizens play to mitigate xenophobia? There needs to be a dialogue. We need both parties, South Africans and migrants, to basically engage and address issues like crime and unemployment. Basically, the hatred directed towards migrants is not going to resolve anything. It is a human phenomenon, a fact of life, whether they are migrants or not. When a migrant commits a crime it is not something that is unique. Everybody gets excited about it but migrants are human beings and the parables that affect all human beings affect migrants. So I think what we need to have going forward is a situation where we can talk about the social ills and the problems that residents of South Africa face, whether migrant or native, and approach it with genuineness and not a desire to create havoc in our community. How severely have xenophobic attacks damaged South Africa's reputation among other countries on the continent? South Africa is not an island on its own, it is a country among countries. As long as attacks on migrants continue in South Africa, it means that the relationship with other countries and all other people will end with them looking at South Africa negatively. I think the truth of the matter is that it has had a very negative impact on South Africa as a country and will affect relations with neighbouring countries and other African states. Thank you for your time, Dr Sibanda.